We’re now several years into the Agile Transformation wave and even the definition of what it means to be Agile seems to change on a daily basis. More often than not, if a company claims to be Agile they are referring to the Agile changes happening at the team or department level with efforts typically focused on products or the software development lifecycle. Teaching engineers and developers to become Agile is one thing, but getting leadership to follow suit is a completely different challenge and one that requires a very different strategy and approach. Additionally, Agile Transformation has moved beyond software and products and is now being embraced in other departments and other capacities. For an organization to have any hope of creating true Agile Transformation and sustainable change that eventually makes its way to the customer, Agile should be embraced and practiced at all levels of an organization - not just with the practitioners. All too often we see organizations spend significant amounts of time and money on Agile adoption efforts, only to see early successes eventually fade over time. In many cases, the reason these changes don’t scale and don’t stick, is because of this disconnect between leadership and practitioners. Where does this breakdown typically occur and how you can prevent it from happening? Initial Planning – In many cases, an eventual disconnect with leadership is set in motion very early on, as a more enterprise-wide approach to Agile Transformation isn’t taken into consideration when planning at the more tactical level. It is often incorrectly assumed that Agile Transformation is simply a matter of assessing gaps, creating a roadmap, adding coaches and slowly creating processes changes over time. While this may be the case for what needs to happen at the team level, a more comprehensive Agile Transformation roadmap needs to additionally include a plan to integrate both tactical and strategic changes that involve all levels of leadership. Communication – It’s very common to hear both leadership and practitioners speaking two completely different languages when it comes to Agile. Given what they are focused on, solving business problems from different vantage points, it isn’t that surprising. For developers and engineers, their primary goal is to create new efficiencies within the SDLC, improve throughput and get updates to the business as efficiently as possible. 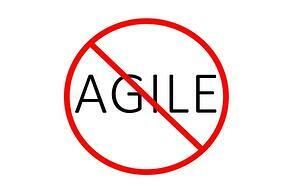 We often call this “Big A” Agile. For leadership on the other hand, they have a much more global view of things. Ultimately their goal is to increase market share and revenues, by maximizing customer experience and creating differentiation in the market. For leadership, the SDLC is only one component of Agile, whereby they seek to increase Agility across an entire department, division or company. We call this “Little a” Agile. Transparency – Knowing that Agile can mean different things to different levels of seniority within an organization, transparency becomes key. All too often these seniority silos create conditions where teams or individuals protect their own interests, without taking into consideration the common good of the entire ecosystem. These walls need to be broken down and transparency needs to reign supreme. Stakeholders – In order to promote transparency and open communication it’s critical that all stakeholders have a voice and communicate openly, on a regular basis. Creating an Agile Transformation group of advocates, or something similar, where practitioners, the business and leadership can create and promote one shared vision, helps to mitigate the silos that typically lead the symptoms mentioned above. So you might be asking, what is leadership’s role in all of this and why are they the ones who may be responsible for killing - or at least hindering - Agile Transformation progress at any given company? As with most things at a company that need to be improved, it’s usually the folks outside of leadership, the practitioners, that feel the pain and are forced to make do with what they have. For example, if a product group is asked to become more Agile, they will do just that and take whatever steps necessary to transform within their own team. But for lasting and sustainable Agile Transformation to occur, a more global view and plan needs to be taken into consideration, and this is something only leadership can help create, implement and maintain. When an organization gets buy-in at the highest levels for Agile Transformation, it creates the foundation for real change and enables the entire ecosystem to work as it should. When Agile Transformation is relegated to various teams or groups and treated as some kind of one-off project or initiative, it can be nearly impossible to create sustained transformation and thus, ROI. Former GE CEO Jack Welch famously said, “Good business leaders create a vision, articulate the vision, passionately own the vision, and relentlessly drive it to completion.” Agile Transformation isn’t some passing fad or some buzz word. The ability of a company to become more Agile and more quickly respond to customer needs and enhance customer experience is fast becoming a significant differentiator in the market. With that in mind and as Jack clearly stated, leaders need to be responsible for creating, articulating, owning and ultimately delivering on the vision of Agile Transformation for their organizations. Without that level of involvement, they will be the ones that ultimately kill or at least hinder, Agile Transformation.